On Friday we explained how many Lloyds Avios Rewards cardholders had unexpectedly received a 2nd annual upgrade voucher in their avios.com account. Click here for that story. Avios has now made a statement on social media about this. Hyatt stops offering home rentals – but Marriott expands! Just seven months after adding it to World of Hyatt, the Oasis home rental group has been dropped as a partner. World of Hyatt members would earn 5 points per $1 spent at Oasis plus late check-out benefits. Nights also counted towards Hyatt status. You could also redeem Hyatt points for Oasis stay credit. Hyatt launched this partnership after buying a minority stake in Oasis. The company has now been taken over and Hyatt sold its stake at part of this process. All ties with World of Hyatt were broken immediately although benefits will be honoured on existing bookings. Coincidentally, Marriott Rewards has just announced that it is increasing its foray into home rentals. The initial trial with Hostmaker to offer London rentals (we wrote about it here) seems to have been a success and the partnership is expanding into Paris, Rome and Lisbon. Stays earn Marriott Rewards points and stay credit. You can find out more here. OT: Does anyone know of any upcoming Hilton hotels sales for stays in the US? The rates are often hiked in the week before the sale and rates during the sale are usually comparable to, or higher than you can get during nonsale periods IME. If you see rates you like book them, if in doubt lock them in with BFR. Points earned on SPG Amex. How do you convert them to Avios? Wait until they land in Marriott Rewards and then transfer out via their website, although note Ghengis’s points which are correct. OT: IHG reward availability – If the availability calendar shows available (white) on several dates but on clicking through to book one those dates there is “No rewards night available”, is this just an IT glitch and the availability is a phantom, or is it worth phoning IHG to book? I’ve seen this in both the way you describe and also the opposite. I have tried calling with no joy. However, I have also found that messing around with arrival and departure dates to cover a multiday stay with two or more shorter stays can sometimes, but not always, yield a result. OT: I have the Amex Travel £200 off £600 offer. Do the flights need to be within the dates specified? Also, the flights are MUCH more expensive then the ones I can see on Google Flights. How do people get around this? Flights can be any time, but the payment on your card must be within the offer period. Regarding cost: there is no “get around”. Pick dates/carrier/class according to price. Check that what you see on google flights is actually bookable at that price. No, just the payment going through. Don’t overpay vs Google Flights but a) don’t assume those fares are bookable and b) don’t assume if they are bookable that they are from a reputable travel agent. Is pending during the offer period sufficient or does the payment have to be completed? Is there anyway to book refundable flights? @Paul, they have a button for more ticket options. You can read the fare rules for each akthough they are not always clear. So did anyone eventually work out the pattern of who did or didn’t get the voucher in the end? OT: I just tried to top up my xmas saver account and was told it finished yesterday. Is this true or should I try a different tesco another day? Harry – is this the refund trick that you mentioned a while back? Seems I am the only one to think Des should have kept his pretty little Twitter mouth shut. Probably fouled it up for the rest of you who didn’t yet get the extra upgrade voucher. Could easily have got Lloyds to reverse the mistaken vouchers. Did you get one Harry? No, I am no longer a Lloyds cardholder. Got a free flight in Europe from them some time ago – from memory it was Manchester – Madrid with a gf jn about 1993 – we had a weekend in Salamanca – but not bothered with them since. Plan was to meet at airport – gf didn’t show up until about 10 mins before flight closed. Always did like keeping me hanging on. Yeah, thanks Emma for the stress. Pretty blonde Swedish girl. There’s always somebody. I was hoping it was something to do with card anniversary and I might have got one in three weeks time. No harm done though, I have enough avios through 2021 barring a serious devaluation. Not sure where you get this idea of ‘enough’ Avios, BJ. ISTR you were very happy not to get the IB 90K Avios for £250 because you had ‘enough’ Avios already? Well, I need 150-300k/y for the BA flights we take. Next years flight is already booked and we have 329k left in the HHA and now doing BAPP. So, saving as an insurance policy against devaluation, Would like to think I’ll still be around in 2041 (I have no cats to worry about) but will not get ahead of myself and will look 3 years ahead at the moment 🙂 Not obsessing about it as long as I can get exEDI miles-earning business class trips for £1500 and PE for £900. Collect the miles for fun mostly, and to provide cheap flexibility. We are cutting our overseas travels back and taking opportunity to discover all of the UK. Missed what Des did on Twitter, but doesn’t sound good. Don’t particularly need another voucher but for some people it may have been useful. As people all have to pay the annual fees it would be fair for all to have extra. Clear that they already knew this was on issue given the wording of their reply to Des. Well, I’m a cardholder, and didn’t get a voucher, so I’m pretty sorry this was brought to their attention. Was really hoping I’d get one last voucher. As has already been mentioned, in the response from LBG they stated that they were already aware that some vouchers had been issued in error. 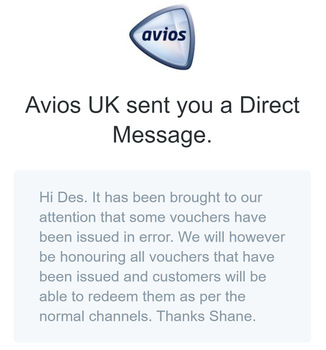 It seems likely that the error was a one-off, so if you hadn’t already got a “mistake” voucher you wouldn’t have received one anyway. I’ve got one sitting there valid until October 2019. I’m still confused at what’s happening with Avios.com – will this voucher still be redeemable in, say, March 2019 and will you still be able to do so via the website? OT just booked MAN-MAD business using Avios IB express 15000 x 2 looks like the only benefit is choice of any economy meal for free. 1 can I cancel within 24 hours for full refund of avios and cash. 2 anyone done this flight and is business booking a waste. is lounge access needed via J? Can anyone tell me if the Lloyds upgrade voucher, can ONLY be used by the primary credit card holder? Can the additional card holder also use the voucher for an upgrade? When making this booking for someone else did you ring BA or can it be done online? I booked for someone else by phone. But unless the terms and conditions have changed recently, only the primary card holder can cook an upgrade return ticket. Just spoke to a manager at Avios Customer services. Did you book it calling BA? Does anyone know if I book dub ord jfk with the first leg on EI, this booked on the AA website, would this earn BA tier points? Thanks. I’ve a requirement to get to Cairo next month and redeemed my voucher for an upgrade to club (ABZ-CAI) This route switches to an A321 for the winter timetable and with no WTP it’s a great deal at 20k avios and £370 in taxes. The BA cash fare for the exact dates was £3542 !